Cycling from Tai Wai to Tai Mei Tuk is a great way to enjoy Hong Kong, you will get to see the natural beauty along the coastline. The total cycling length is around 27km and will take a maximum of 3 hours to complete. After gathering at 10am in Tai Wai MTR Station, we will rent a bike at the bike shop near Tai Wai MTR Station, ride along the scenic coastline of Tolo Harbour, then head towards Tai Mei Tuk. 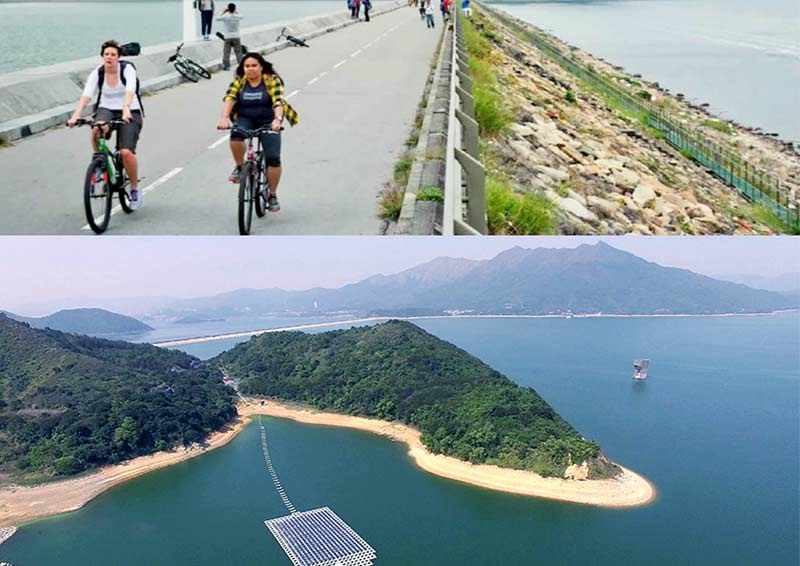 We will then cross the main dam of Plover Cove Reservoir where the Floating Photovoltaic System (FPV) is located. After the visit, we will cycle back to Tai Mei Tuk and return the bike there. The trip will finish at 2pm. There is a trend of developing FPV system on reservoirs and ponds in overseas countries. Apart from the obvious benefit of harvesting renewable energy from the sun, there are additional advantages of FPV on the reservoir surface, including reduction of water evaporation, suppressing algae growth, saving precious land resources and yielding higher solar panel power generation efficiency. A short briefing will be provided by Alex So who works for the consultant designing the Floating Photovoltaic (FPV) systems. The event is free of charge but preregistration is required. You just need to pay on event day for the bike rental and the cost is HK$100 (return before 5pm). Your own bike (optional). Please make sure it is functional and check tyre pressure. Cloths for exchange. Suggest to wear cycling pants with pad. Participants must be competent in cycling. Participants are fully responsible for any injury or damage caused during the event.